IF AMERICA had laws making voting compulsory, as Australia and Brazil do, then a new report recording the size of the Hispanic electorate would have Democrats dancing jarabes of joy. The report, based on census numbers crunched by the Pew Research Centre, a non-partisan think-tank, predicts that a record 27.3m Hispanics will be eligible to vote in the elections of 2016. That is good news for the left. Even before Donald Trump decided to build his Republican presidential campaign on a foundation of ugly nativism, accusing Mexico of sending rapists and other criminals to flood America and vowing to build a wall on the southern border, Hispanic voters have strongly favoured Democrats in recent presidential elections. They handed Barack Obama more than 70% of their votes in 2012, in part after the Republican candidate, Mitt Romney, vowed to make life so wretched for illegal migrants that they would “self-deport”. On paper at least, the Pew report offers a second reason for celebration on the left. 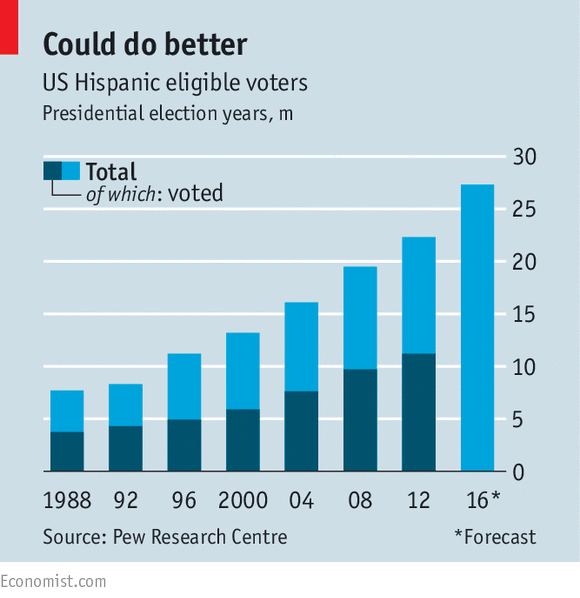 The Hispanic electorate will not just be larger than ever in 2016, it will be astonishingly young. Almost half of all Latinos eligible to vote this year will be “millennials”, or young adults aged 18-35. For comparison, just over a quarter of whites eligible to vote will be millennials. Nationwide, young people are another bulwark of Democratic voting, with three-fifths handing their votes to Mr Obama in 2012. Unfortunately for Democrats, America does not have compulsory voting. That fact has an outsize impact among ethnic, racial and socio-economic blocs with low rates of turnout. As the Pew report notes, with each recent election the number of Latinos who can vote hits a new high. But at the same time, the number of Latinos who do not vote also hits a new high. 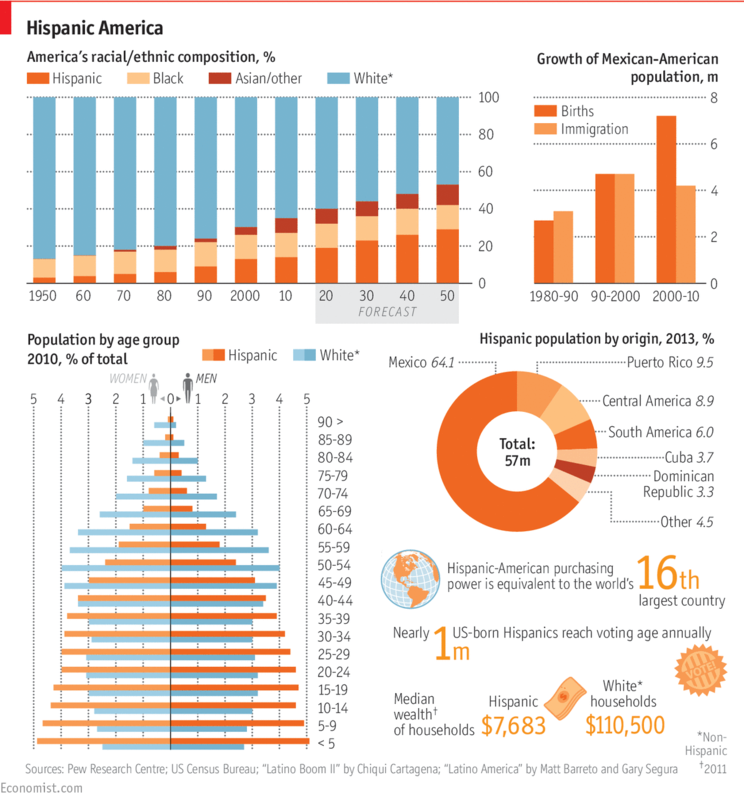 America is home to about 57m Hispanics, out of a total population of around 321m. But more than half of them are not citizens or are too young to vote. Add on low rates of turnout, and only just over 11m Latinos voted in 2012. This is something of a chicken-and-egg puzzle. Because Hispanics have influenced few elections, many see no merit in voting, and political parties have often only paid lip-service to wooing them. Though immigration was often in the headlines in 2012, less than half of the 23m Hispanics eligible to vote in that presidential election turned out. The apathy of young Hispanics was striking: in 2012 just 37.8% of Latino millennials who could have voted did so. Half said they were not even registered to vote. The causes are many. Youth is a big one, made worse by relatively low levels of education (though Hispanic numbers are improving). Geography is a big piece of the puzzle. Just over half of all Hispanic eligible voters in 2016 will live in California, Texas and New York, and “those aren’t battleground states” says Mark Hugo Lopez, director of Hispanic research at Pew. Hispanics are not without clout, though. They live in impressive numbers in three swing states, Florida, Nevada and Colorado. Watch Florida with special care. More than one presidential election was arguably swung by Cuban-Americans, who are traditionally more conservative than other Hispanics and mostly live in Florida. But younger Cuban-Americans are less conservative (though Senator Marco Rubio of Florida, a 44-year-old contender for the presidency, whose parents moved from Cuba, is a flinty Republican). Roughly a million Puerto Ricans now live in Florida, many after fleeing economic misery on their home island. Puerto Ricans are American citizens and can vote as soon they reach the mainland. In Miami, Tampa and Orlando at least, politics this year will have a distinct Hispanic accent.